OZZFEST JAPAN--the first major international music festival to ever travel to Japan--will return to Makuhari Messe arena (just outside of Tokyo) Saturday, November 21 and Sunday, November 22. The two-day festival will feature headlining performances from two OZZFEST veterans: festival namesake Ozzy Osbourne (who will perform as OZZY & FRIENDS) and KORN. EVANESCENCE is the first additional act to be announced for a festival bill that will include more than 22 performers. OZZFEST JAPAN--a collaboration between Sharon Osbourne and Japanese promoter Hayashi International Promotion (H.I.P.) --debuted in May 2013 to sold-out crowds of 20,000 per day and wide critical acclaim. Ozzy’s OZZFEST JAPAN performance is one of six shows the multi-platinum, three-time Grammy® winning singer and songwriter has scheduled this year. KORN’s appearance is a highlight of the band’s 20th anniversary celebration. 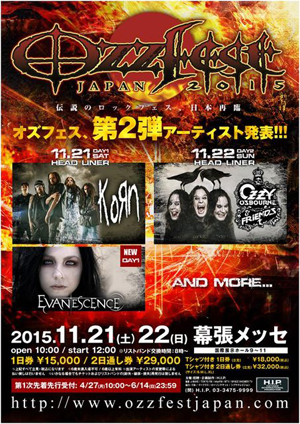 EVANESCENCE will both make their OZZFEST debut at OZZFEST JAPAN, in their only performance of 2015. The remaining acts on the OZZFEST JAPAN lineup will be revealed later this year. Organizers say fans can expect performances from a dynamic mix of international and domestic bands, all of which will reinforce OZZFEST JAPAN as the leader in the Japanese rock festival market. Ozzy Osbourne has sold more than 120 million albums worldwide. Osbourne's career has spanned more than four decades (as both a successful solo artist and as the lead singer of BLACK SABBATH) and his music is as relevant today as ever, still being heard daily on TV, in movies, on radio and at stadium sports events. This year will mark 20 years since Osbourne created his name-sake hard-rock/metal touring festival, OZZFEST, which had a hugely successful 14 year run across North America and the U.K. In their more than 35-year history in Japan, promoter H.I.P. has worked with international superstars including AC/DC, Mariah Carey, Celine Dion, Taylor Swift, GUNS N' ROSES, as well as Japanese powerhouse newcomers MOMOIRO CLOVER Z and internationally celebrated band ONE OK ROCK. Most recently, H.I.P. partnered with SLIPKNOT to launch their acclaimed music festival, Knotfest, in Japan, which drew sold out crowds each day. OZZFEST JAPAN 2015 ticket prices are as follows: single-day general admission tickets are ¥15,000; single-day general admission tickets including a commemorative shirt are ¥18,000; weekend passes are ¥29,000; weekend passes including a commemorative t-shirt are ¥32,000. All prices include consumption tax, box office commission and ticket printing fees. The latest news on OZZFEST JAPAN can be found at www.ozzfestjapan.com.